The name entered here must correspond to a request parameter such as rq_AppGuid and the regular expression ^\*[A-Za-z_0-9]+$|[A-Za-z_][A-Za-z_0-9]+\*?$". With *_Save, all request parameters that end with _Save will be validated. With rq_Action*, all request parameters that begin with rq_Action will be validated. With rq_ActionID, only request parameters that correspond to the name rq_ActionId will be validated. This setting is defined automatically if the parameter is a system parameter. This setting is not defined for user-defined, user-created parameters. Items with greater areas of validity take precedence here. With the system-wide scope, a parameter will always be checked, whereas selecting Restricted to application area will only check the parameter values within an application (e.g. if you want to test if your test parameter has a certain value on the start page of an application). The portal.log files where the portal log is written can be found in the portal directory /log. 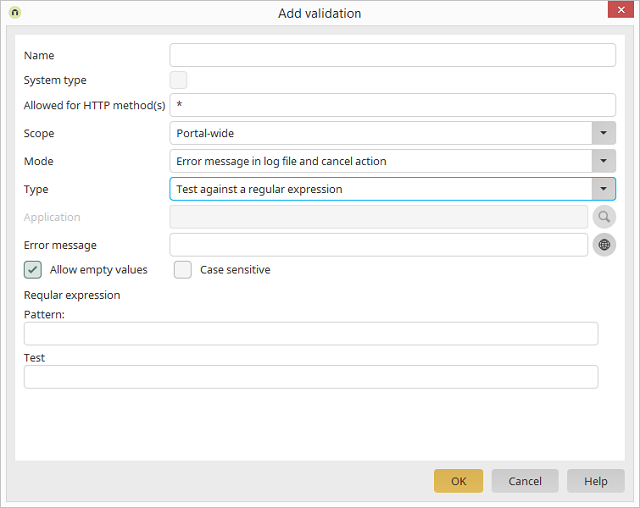 Select the desired validation type here. The selected application page is shown here if you have selected a scope that relates to an application. 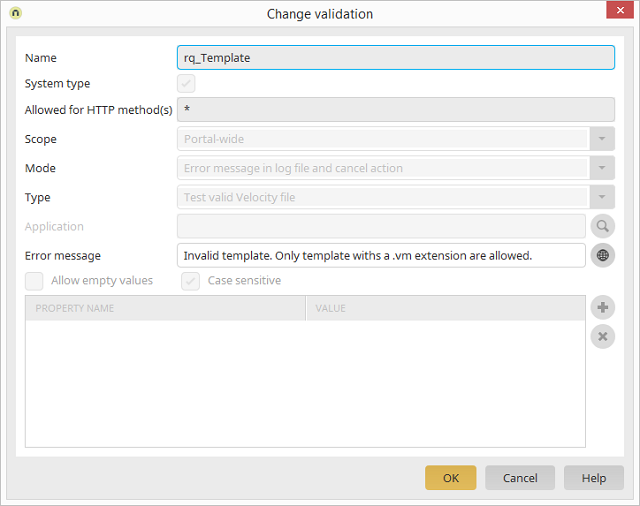 Opens a dialog where the desired application and page, which should be validated, can be selected. 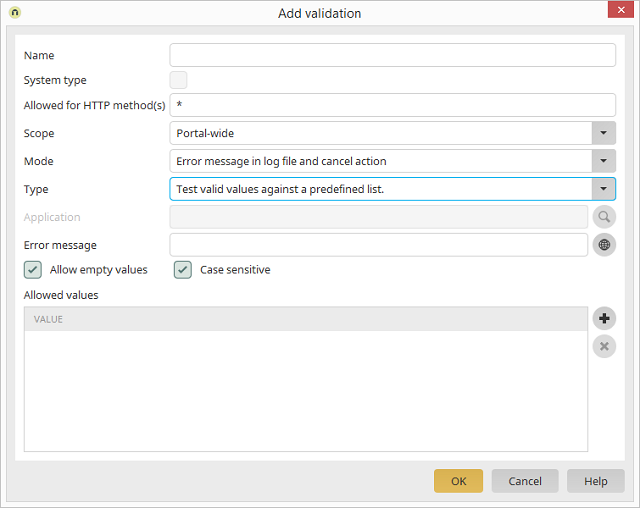 You can define a text that will be written in the log if an error occurs. Depending on which type is selected, the table may or may not be editable. The permitted value should be defined at the bottom of this dialog for this type. Empty values will not be seen as an error with this setting. The case will be taken into account during the validation. Adds a new row where the value can be entered. Deletes the row currently highlighted. You can enter your pattern that should be searched for here. A valid pattern can be recognized based on this symbol, invalid patterns based on this symbol. You can enter character strings to test your pattern here. Valid entries can be recognized based on this symbol, invalid entries based on this symbol.